The whole of San Francisco, as viewed from the Bay Bridge. A place without people does not a city make. If you’ve ever been to San Francisco, you know that the urbanscape is brimming with tourists, joggers, cyclists, the jet-set and sweater-wearing locals alike. Peppering the roadways are an impressive array of vehicles- cars, trucks, streetcars, cable cars, trolley buses, little diesel powered buses, light rail and para transit. Life is moving in the City by The Bay; the second densest city in the whole of the United States. Escaping both the motors of the economy and of the its vehicles is now more than just a dream…it is art. Ross Ching, a San Francisco based artist that describes himself best by being able to run at great speed and be most inspired by driving around, has envisioned just that: a San Francisco free of hustle and bustle. A city with only parked cars, fog, bridges with no load but daylight, are featured all in his semi-photographic works, “The Empty America Series“. In a video featuring the works, San Francisco’s Union Square lacks its pedestrian packs of those seeking out cheap jeans and gorgeous chocolate. 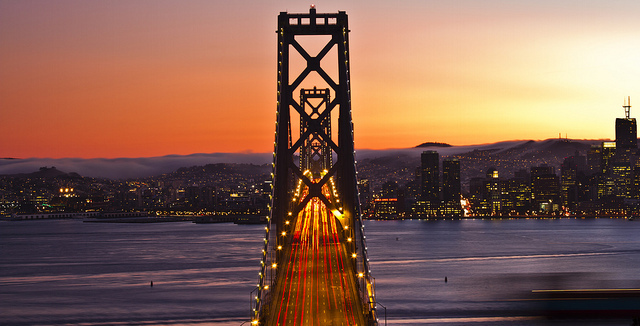 The Golden Gate Bridge, icon of California and The City, holds only sunlight on its four abandoned lanes. Market Street has only trees in motion with the wind. Ching’s series, was inspired by fellow artist Matt Logue’s series E M P T Y L A, which features stills of a Los Angeles free of anything but concrete and glass. Though to a native Angeleno, as this blogger is, the empty sidewalks featured here are not altogether surprising, other photos feature the almost unfathomable: empty freeways across Los Angeles. These photos serve as reminders that the built environment is indeed a landscape reflecting the human impact of placemaking. Thinking of an empty San Francisco is indeed a flight of fancy. A pedestrian free world -or even a bus, car or train free one- is a charming figment of these artists’ imaginations. As we escape the sometimes overwhelming city in our minds, we can rest assured that the only place we’ll see a blank San Francisco realized is in Ching’s moving pictures.